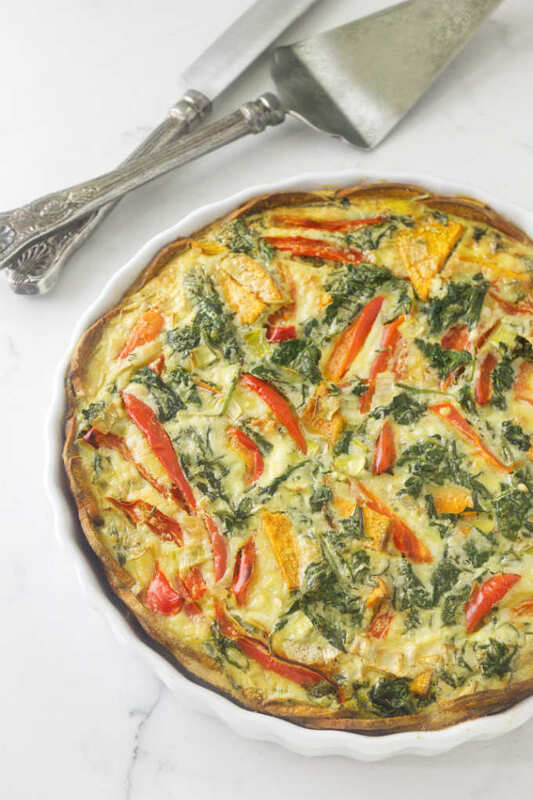 There is a kaleidoscope of colors in this Goat Cheese Quiche with Sweet Potato Crust! The non-traditional crust of sweet potato slices forms the backbone of this goat cheese quiche. 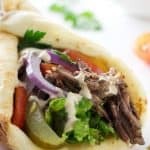 It is low in calories and high in nutrition and flavor. Bright, colorful garden veggies of kale, leek, red bell pepper and more sweet potato slices are combined with a tangy, custard-like filling. We served this goat cheese quiche as a Sunday brunch entrée for a small gathering and it was a big hit. The fresh garden veggies of kale, leek and red bell pepper paired well together with the sweet potatoes and creamy filling. 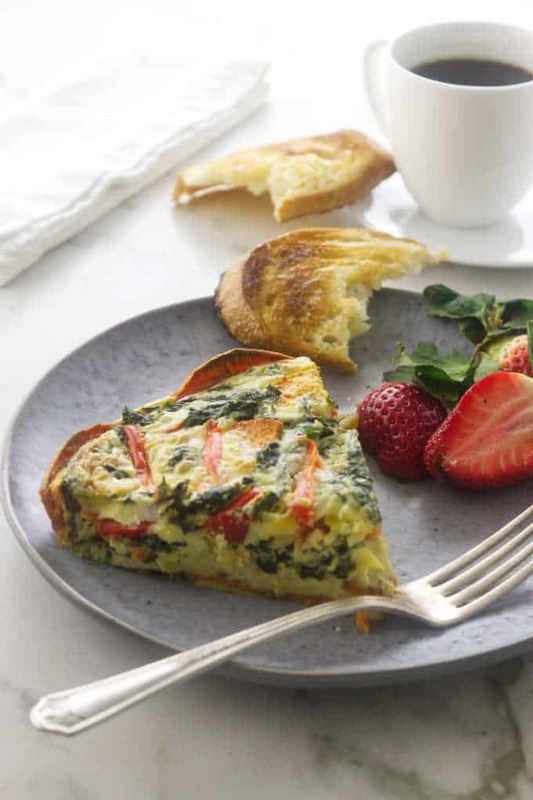 With a piece of fruit and a slice of this quiche for breakfast you will get your day off to a great start. There is only 185 calories, 10 grams of protein and 14 grams of fat per serving. 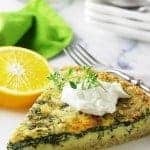 This goat cheese quiche is also a great dinner option when served with a side salad and crusty bread. If you are a working mom that packs a lunch every day this healthy goat cheese quiche with sweet potato crust is for you. It is very portable and reheats well. And, if you are an on-the-go mom that needs a quick lunch for the kids you will be getting some good, healthy veggies into them. They are from two different cuisines…a quiche is from France and a frittata is from Italy. While both have eggs and cheese as a base they are both a wide canvas for creativity with many options. Adding a variety of veggies and/or meats increases the nutrition value and the flavor. 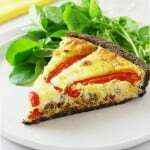 The differentiating factor between a quiche and a frittata is a quiche will have a crust and a frittata is crustless. A quiche crust can be a classic rich, flakey pastry like the one we used for our Leek, Bacon and Goat Cheese Quiche. A crust can also be less calorie-laden by making it with quinoa, black rice, or polenta. Our spinach-gouda quiche with quinoa crust is a good example. Frittatas can have all the ingredients of a thick quiche and can also be oven-baked. 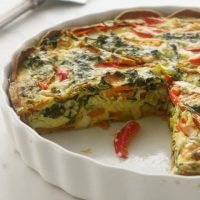 There is another frittata style made with fewer filling ingredients. It is thin and pancake-flat, usually cooked on the stove top and finished in the oven. It resembles an open-face omelet. Spray an 11-inch quiche dish/pan with non-stick oil. Peel the sweet potato and cut it into thin 1/8-inch slices. 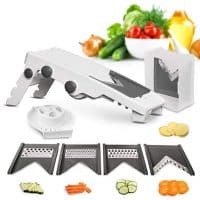 We used a mandoline slicer but a food processor with a slicing disc will also work. Arrange part of the sweet potato slices in the prepared dish to cover the bottom. Cut enough of the remaining slices in half to line the edges of the dish. It’s OK to overlap the slices. Bake for 10-minutes and set aside to cool slightly. Pile the kale into a large plate, and microwave for a couple of minutes until lightly wilted. Remove from the microwave and with scissors, cut the kale slightly. Sauté the leek and the red bell pepper slices and cook until just beginning to soften. Arrange them over the cooled sweet potatoes. Distribute the kale over the mixture. Blend the goat cheese, sour cream, and eggs together until smooth. Stir in the thyme leaves, salt pepper, and red pepper flakes. 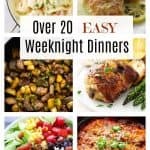 Pour the egg mixture over the vegetables and slide additional strips of sweet potato into the mixture to fill the dish to the top and bake for 50-55 minutes or until puffed and golden brown. Can I freeze this quiche? This goat cheese quiche with sweet potato crust will freeze beautifully. 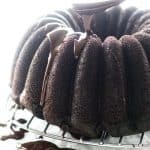 Let it cool completely before wrapping it in and putting it in the freezer. When it is time to re-heat it, make sure you defrost the quiche completely before reheating. It is best to let the quiche thaw overnight in the fridge. When you reheat the thawed quiche, pre-heat the oven to 350°F and cook it for 15 to 25 minutes or until it is heated all the way through. What kind of cheese is best in a quiche? Preheat the oven to 350°F Spray a 11-inch quiche dish/pan with non-stick oil. Peel the sweet potato and cut into thin 1/8-inch slices. If possible, use a mandoline for uniform slices. 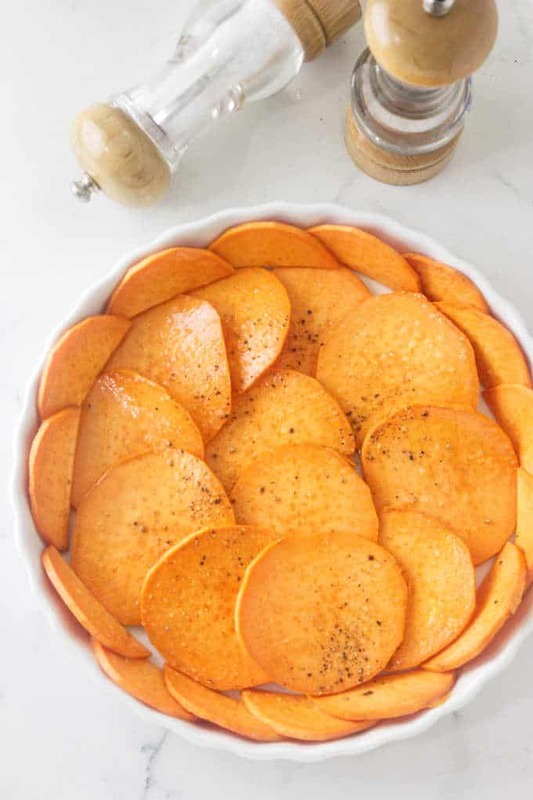 Arrange part of the sweet potato slices in the prepared dish to cover the bottom. Cut enough of the remaining slices in half to line the edges of the dish. Sprinkle the rounds with salt and freshly ground black pepper. Transfer the dish to the oven and bake for 10-minutes. Remove and set aside to cool slightly. Add the olive oil to a skillet set over medium-high heat and when it is hot add the leek and bell pepper slices, cook until just beginning to soften. Remove the skillet from the heat. Arrange the leek and red bell pepper slices over the dish of cooled sweet potatoes. Distribute the kale over the veggies. Add the soft goat cheese to a mixing bowl with the sour cream and using an electric mixer beat until well combined. Add the eggs and continue mixing to a smooth and creamy consistency. Stir in the thyme leaves, salt pepper and red pepper flakes. Pour half of the egg mixture into the dish over the vegetables. With a fork, lift the mixture slightly to allow the egg mixture to settle around the veggies, then add the remaining egg mixture. Add additional cut strips of sweet potato, sliding them down into the egg mixture. Place the dish into a rimmed baking sheet and transfer to the oven. Bake for 45-50 minutes until golden, puffed and the center is set. 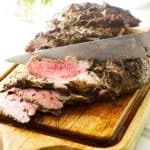 Remove from the oven and allow to cool 5 or 10 minutes before serving. A slicing disc in a food processor or a mandoline slicer will make even slices of sweet potatoes. 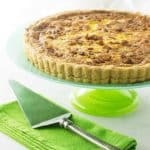 The baked and cooled quiche can be stored tightly covered in plastic wrap in the refrigerator for up to 5 days. The quiche can be served cold, room temperature or reheated in a preheated 350°F oven for about 15-25 minutes or until heated through. 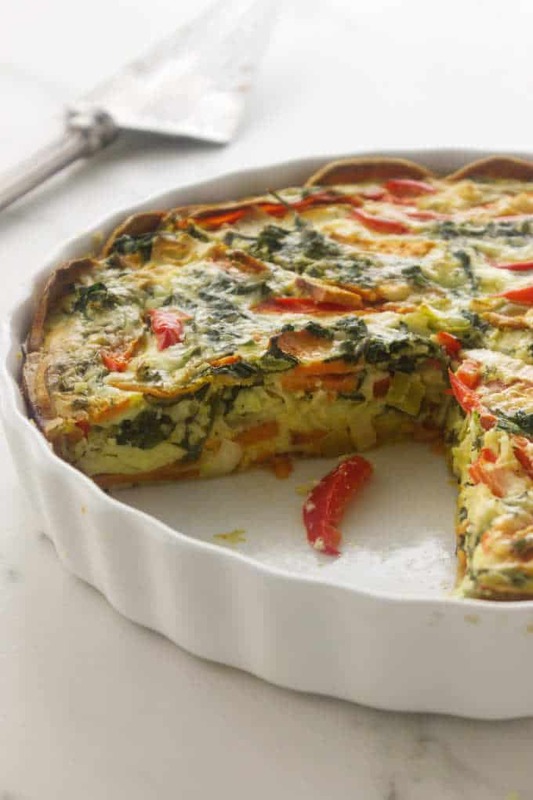 A baked and cooled quiche can be frozen for up to 3-months. To reheat a baked frozen quiche, first thaw it overnight in the fridge then bake in a preheated 350°F oven for about 15-25 minutes or until it is heated through. Have it reach at least 165°F. A thermometer can help determine the initial temperature.